Yes, it sounds like a learned historical essay such as ‘The Lollards of Pre-Reformation England’ doesn’t it? But it isn’t. 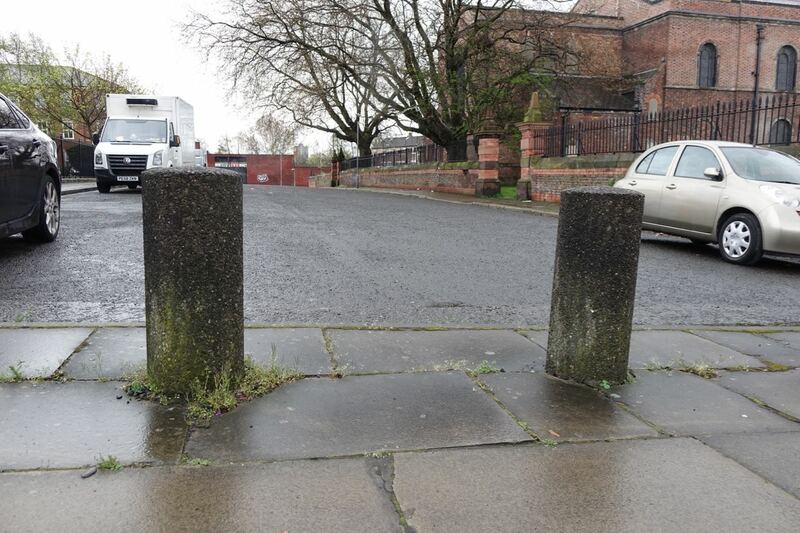 Part One here of a two part quest to find out why Liverpool 8 has so many bollards. Well why are there? Do you know? 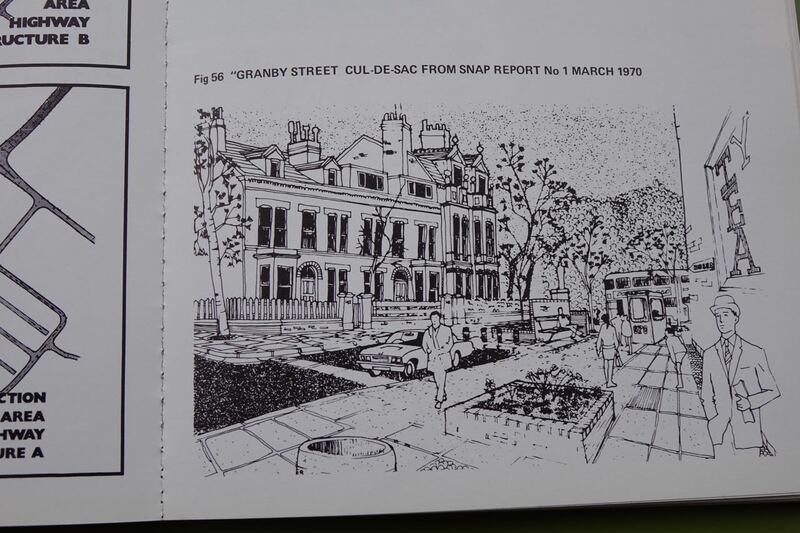 Closing off Granby worked for Granby, but of course the kerb crawling problem simply moved – to the Canning area – resulting in the closing and bollarding of most of the streets leading onto Upper Parliament. All fine, I’d say and as accurate as my own memory and the definite evidence of the SNAP report can confirm. Except I now realise that my mental walk around the intriguing question had only reminded me of the blindingly obvious examples of our rich bollard heritage. So come with me now and let’s walk around to celebrate and find what a load of bollards we’ve got. Beginning here in Berkely Street. 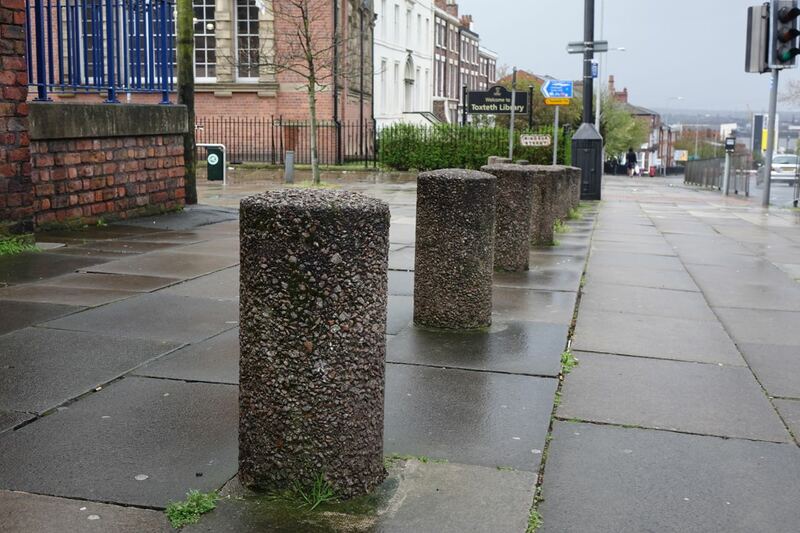 Bollards of relatively recent vintage compared to some we’ll see. Here on the Rialto/Upper Parliament Street corner was one of the centres of the 1981 riots. And so clearly needed this maximum bollardisation. What shall we call these? 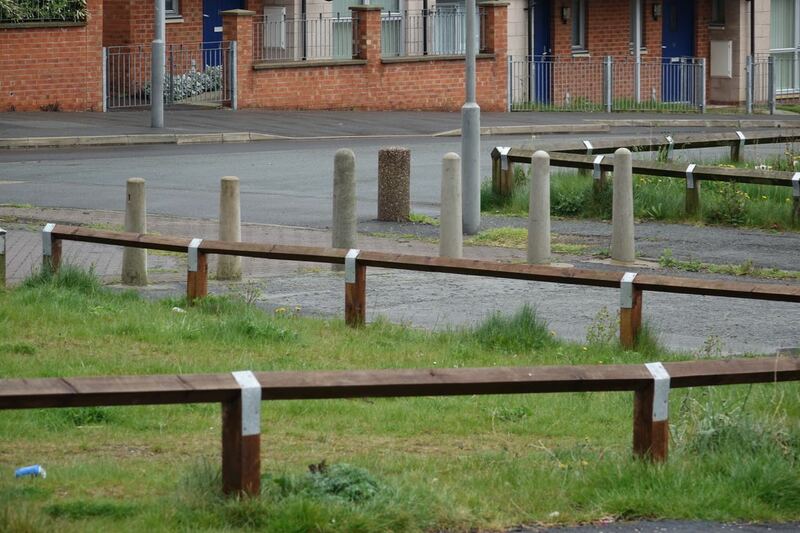 Fat bollards? 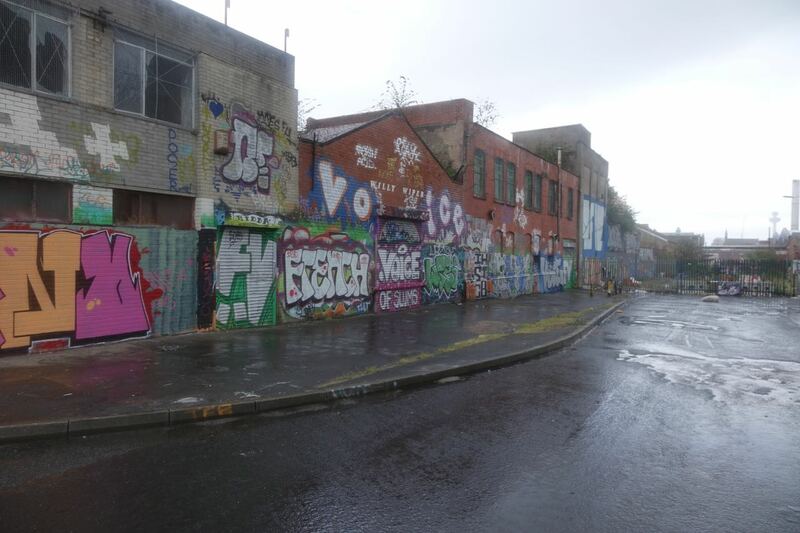 Across in Percy Street, the Canning Area was bollarded to stop kerb crawling after it had moved here from Granby in the early 1970s. Curious bollarding this though. And it’s the same on all the other Canning Area streets. 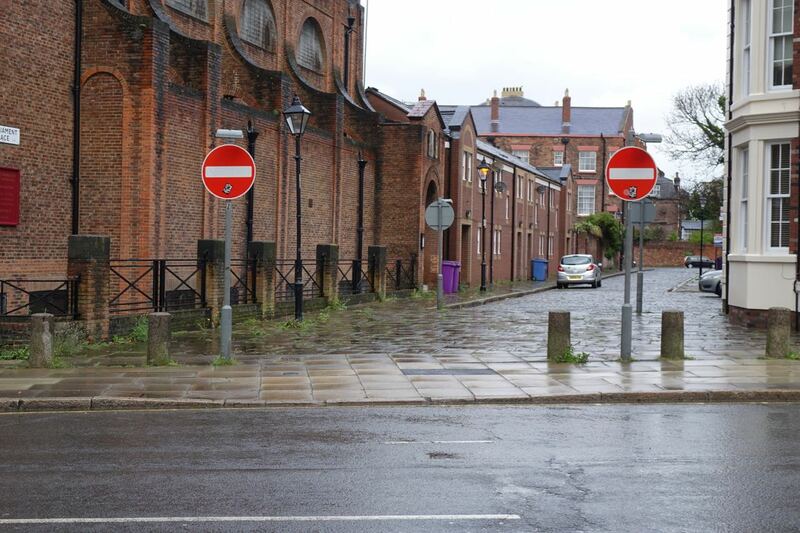 There are bollards and you’re forbidden from driving in, but the road is not actually blocked off. Access for emergency services, or in case those splendid but long empty homes get squatted? Same along here at Parliament Place. Though in the mid-1970s I had a couple of friends who lived in a flat in Cathedral Mansions at the end there, and I remember them telling me that turning the street into a cosy cul-de-sac, before those new houses were built, had actually created a safely unobserved place for the street workers to take their ‘clients.’ Good, considerate urban design! Along here is the 1980s blocking off of Windsor Street. This was formerly one of the main roads through Liverpool 8 and it now shares a kind of ghost status with a couple more ex-main roads we’ll see shortly. 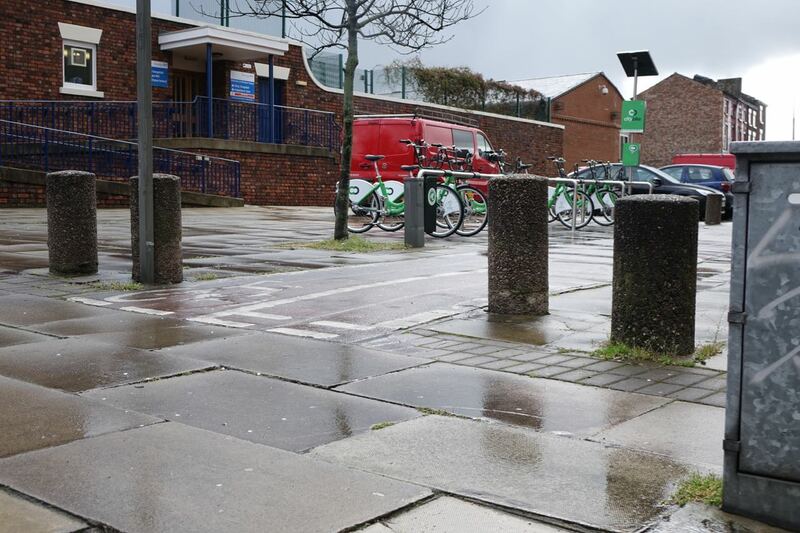 The bollards do part politely to let bikes through though. Leaning gently now with age. 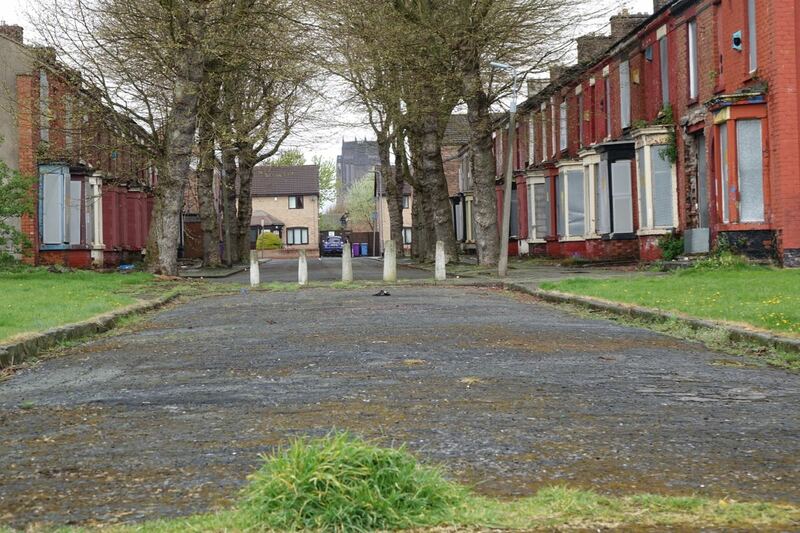 Across the road the Cathedral is aggressively bollarded at this Liverpool 8 end. Just in case we thought we were welcome in. I’ve never seen any vehicle of any kind parked in there. So well done you bollards. Good job! 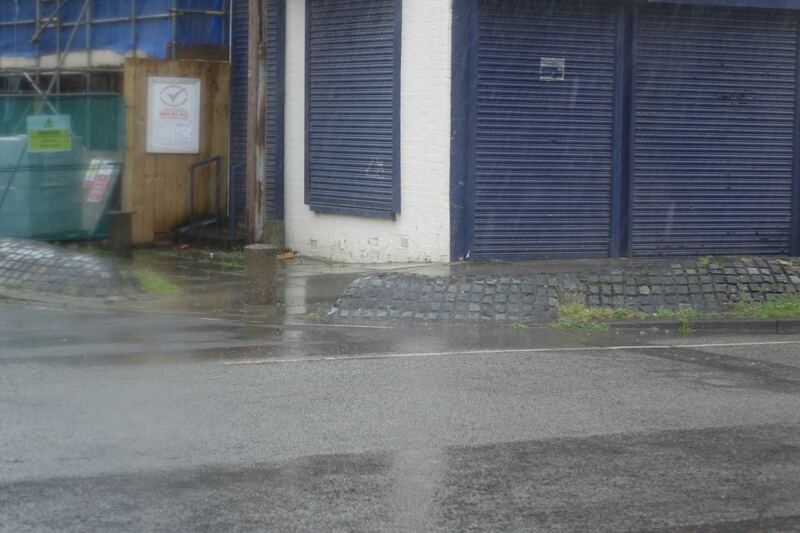 Now, as the rain pours down enough to make it look especially miserable, we come to one of those ex-main roads I mentioned. 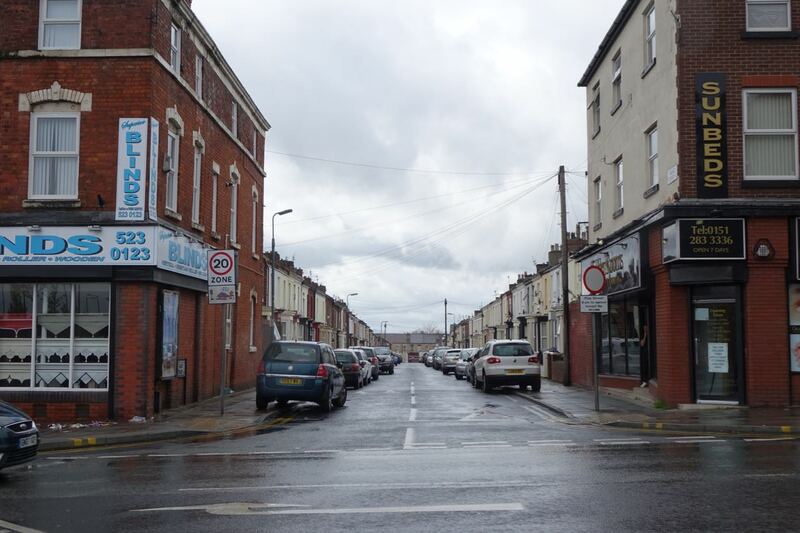 Mill Street, formerly a thrivingly busy road through the middle of the Dingle. Now it’s an urban desert. From town I used to get either an 82 bus along Park Road or an 85 along here. Now there’s no such thing as the 85. Leftover bollards? Having no apparent function at all. Creating unobserved ‘play areas’ like this. 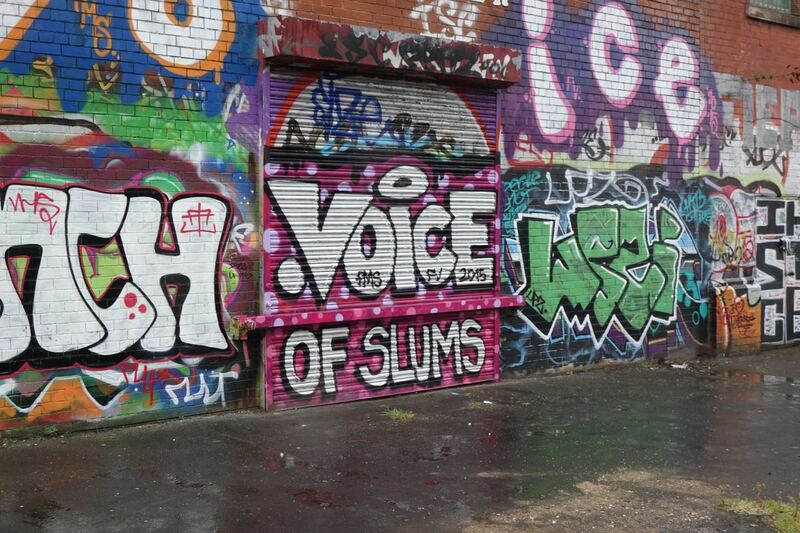 I’d thought I was just photographing the splendid graffiti. Until I noticed the bollards in the corner. Welcome you! Now we’re getting to where the tenements used to be. Caryl Gardens. And another of those ex-main roads, Grafton Street. Now on a map, even now, Grafton Street might look like it stretches from Parliament Street to nearly Aigburth, at least two miles away. Indeed Grafton Street, I’d say, is the most interfered with street in Liverpool. Walking on to that estate there and along for a bit, just when I think the street’s getting going it gets broken down again. Disappears as an actual street for 50 yards or so. And do you know what? I think Owen Hatherley is right. In ‘A guide to the new ruins of Great Britain’ he talks about this 1970s and onwards cul de sac building and containment of whole areas with bollards being imported from military experience in Northern Ireland and aggressively promoted by British police forces as ‘Secured by Design.’ Its ulterior purpose though being to enable a small number of security personnel to contain, subdue and as we now call it ‘kettle’ the supposed potentially riotous working classes much more easily than the old porous grids of terraced houses would permit. Certainly these roads and estates I’m walking through here could be easily sealed off and any vehicle larger than a bike would find it almost impossible to escape. Hemmed in by cul de sacs and bollards. 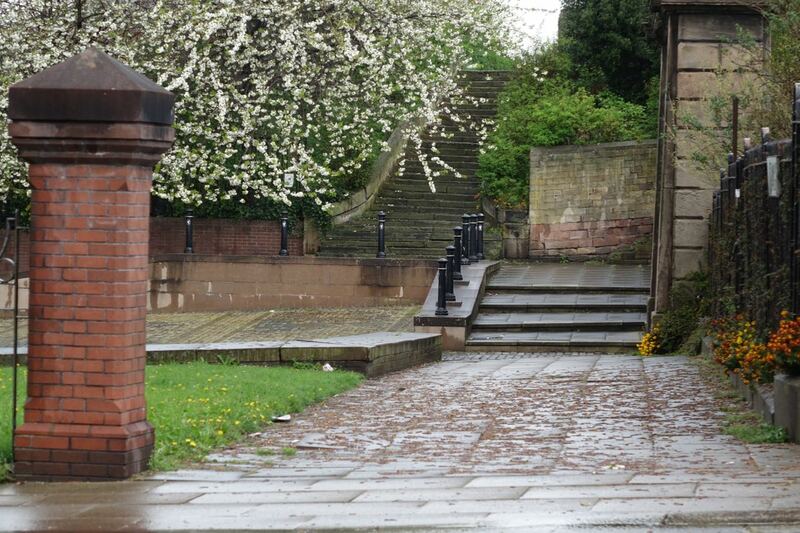 But even in the driving rain there are small corners of intense beauty. St Gabriel’s and Yates Street here. Bollard free. Back up on Mill Street, one of several examples of some brand new bollards. 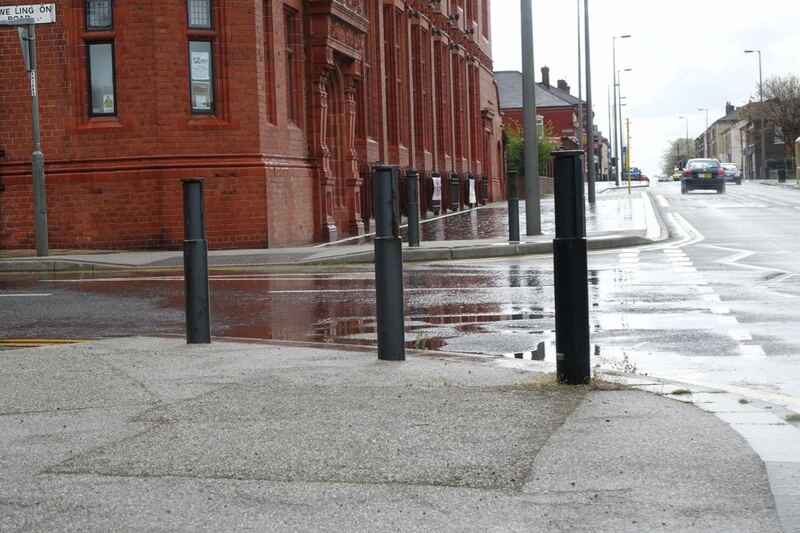 Corner bollards by the Florrie. To stop cars being parked? Or to allow the side road to be more easily blocked off? Then after here, at Woodruff Street, the bollards stop for a while. 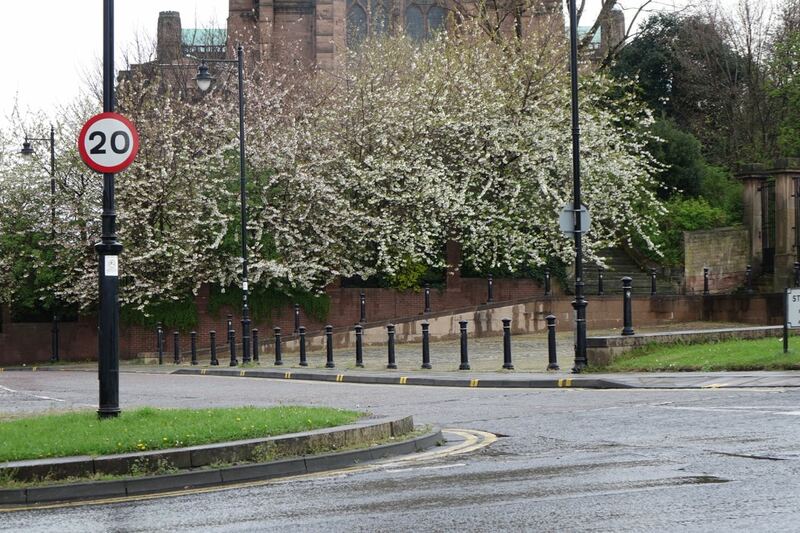 Along Park Road, the Dingle’s only remaining main road, no bollards. The settled and popular terraced streets of the Holy Land? Bollard free. The other side of a Tesco mausoleum though, they’re back. Protecting and prohibiting what exactly? 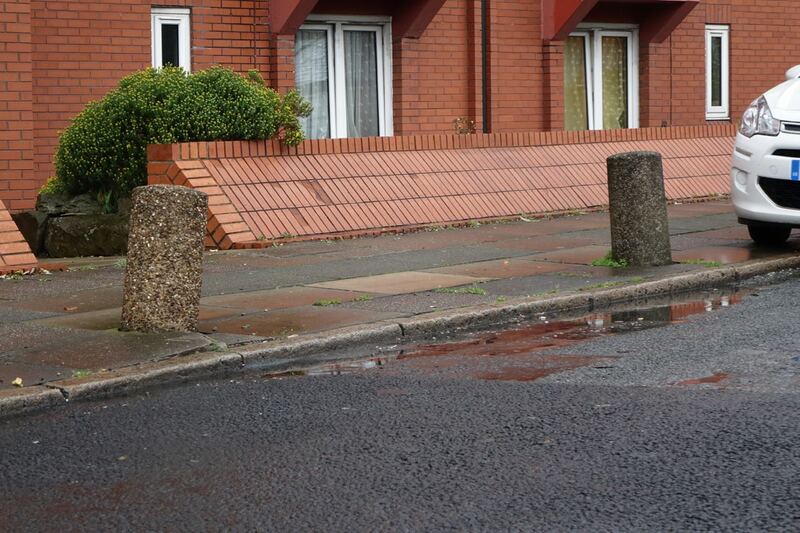 A lonely and pointless bollard, leftover by time. 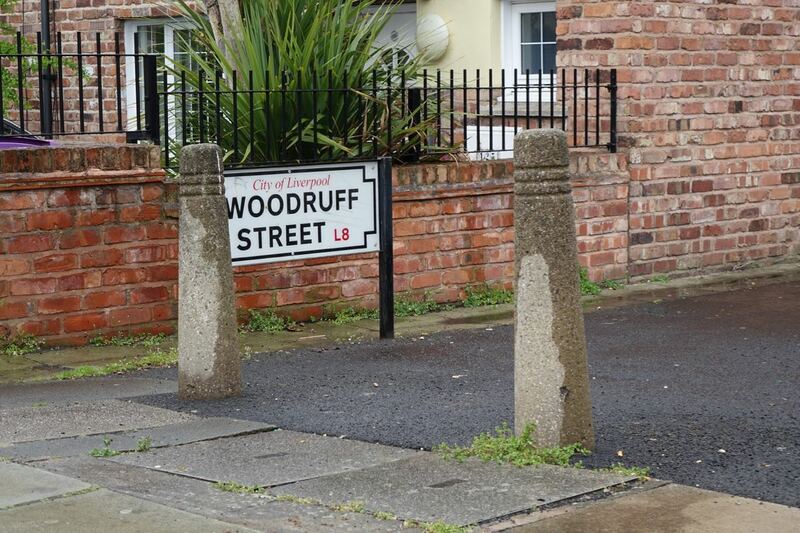 Now let’s see how the Welsh Streets are doing for bollards? Scathed in so many ways. After all, wouldn’t want to stop Beatles fans getting to Ringo’s house would we? Still though, in pure bollard terms I’ve spoken too soon. 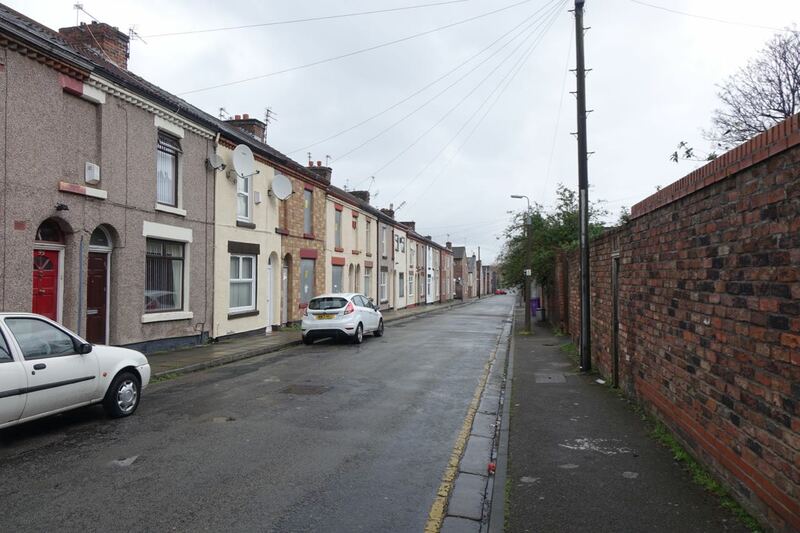 Welcome to Voelas Street, an absolute classic of the bollarding genre. 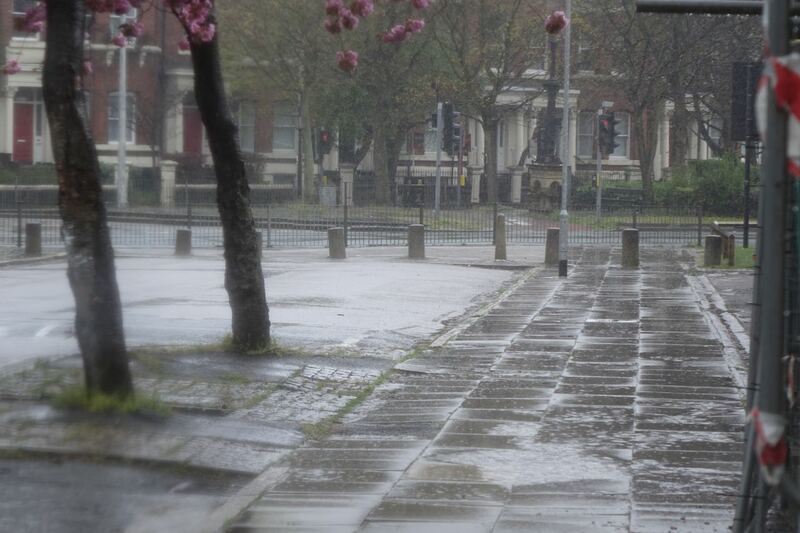 Where both ends of this empty half of the street are bollarded off. Looking one way down the empty section of the road? 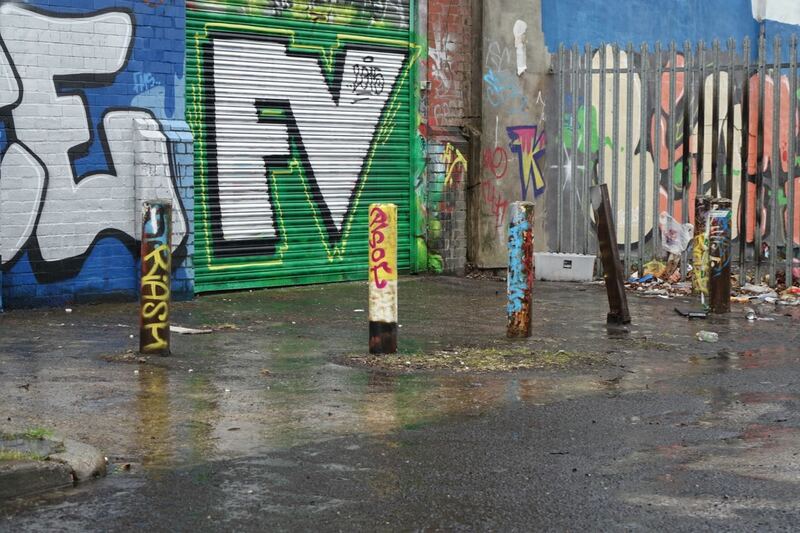 Bollards. And turning to look the other way? Double bollards. As I said, a bollarding classic. Could well get a blue plaque one of these days for its beyond belief pointlessness. 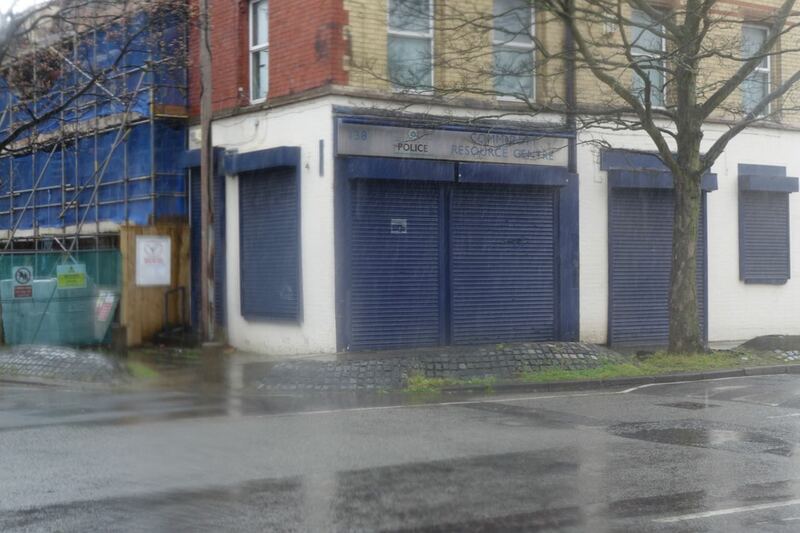 Nearly at Granby now where, as we know, the bollarding of Liverpool 8 truly got going. 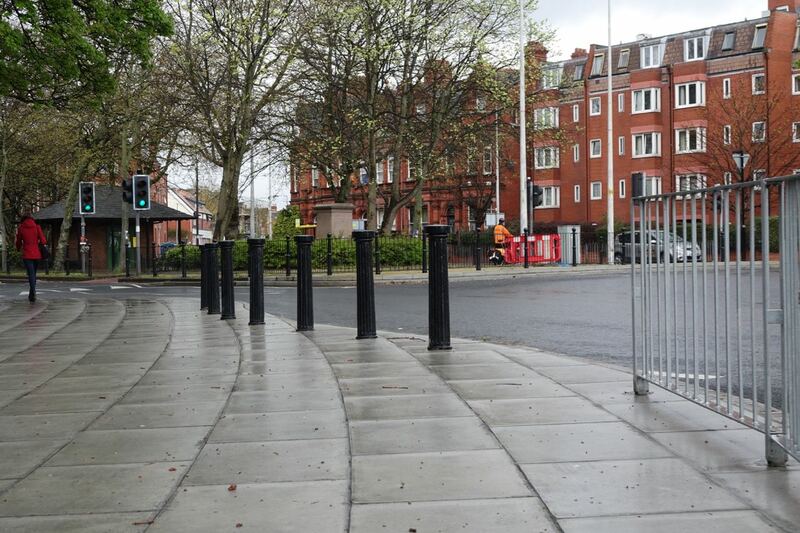 And here are some new bollards. 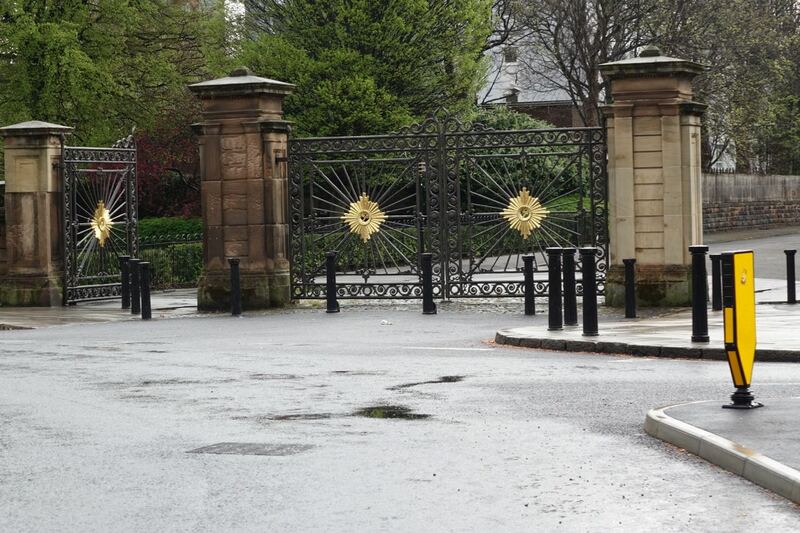 In fact it’s a bollards party, dancing in front of the gates of Princes Park. Across in Kingsley Road, protecting or prohibiting prescisely what? 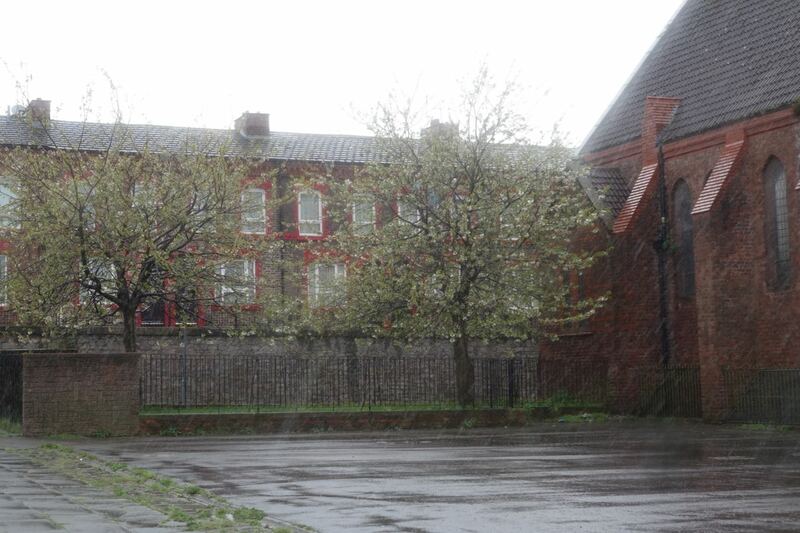 Arriving at last, in the driving rain, at Ducie Street. 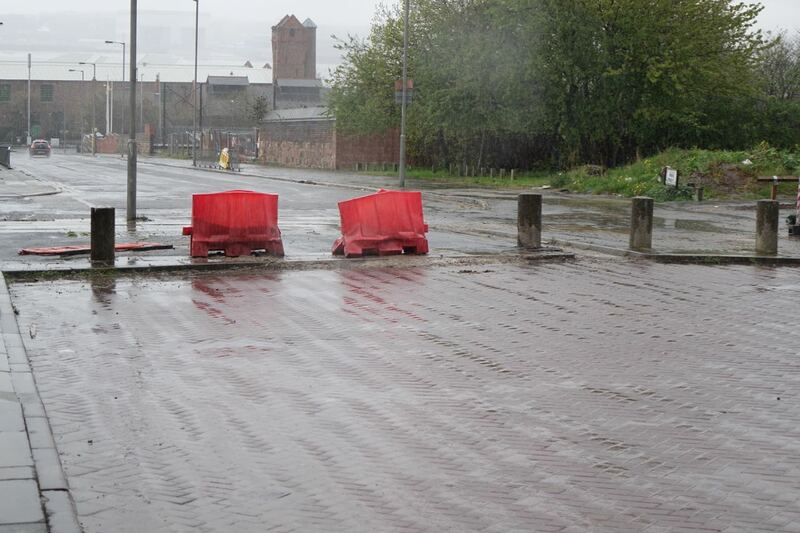 And the red light bollards I talked about at the beginning of all this. 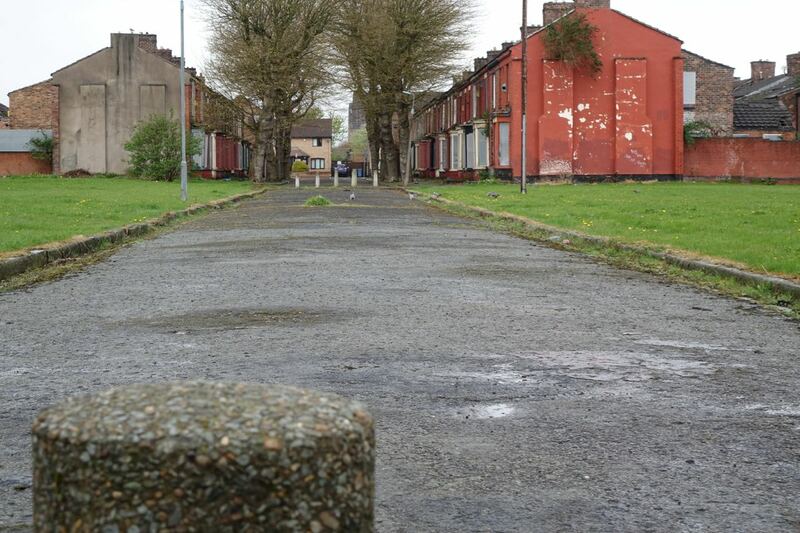 Voted for by the residents during the days of the Shelter Neighbourhood Action Project, 1969/1972 to cut one of the area’s major problems, kerb-crawling. Two of the four remaining original streets bollarded at this end. Three of them at the other Princes Avenue end. 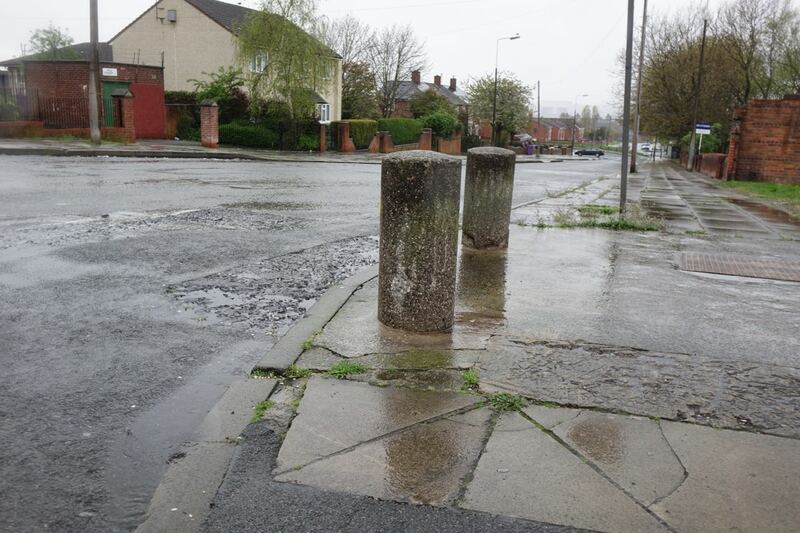 At which point I decide, blog post or no blog post, that me and my camera have walked through more than enough rain on this urban design quest to find the perfect bollard. One final example then. 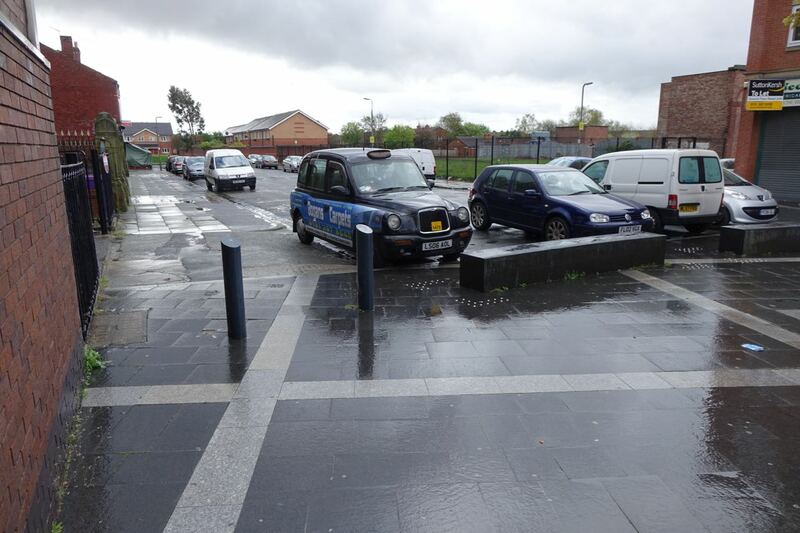 An uber and banked-up bollard. It was the police station after all. There’s so much else to show you. Around Granby, also those riot hills down by the Women’s Hospital and some posh and colourful bollards to go with them. So I’ll add to this lot on a drier day. Meanwhile, as the rain continues here on this wet play afternoon? A quick look at that SNAP Report. I’m going to do a full post on this one of these days, but just a quick look here at them planning the blocked off streets and ending the kerb-crawling. How it might have all looked, 1970. Though Granby Street never was blocked off at this end. 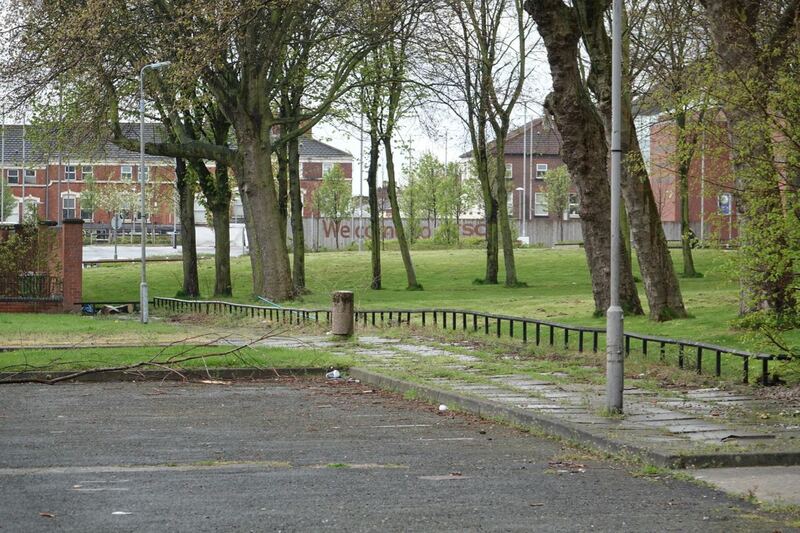 But see how the road is narrowed with ‘landscaping’ trees and the bollarded bays that are to be used for car parking? 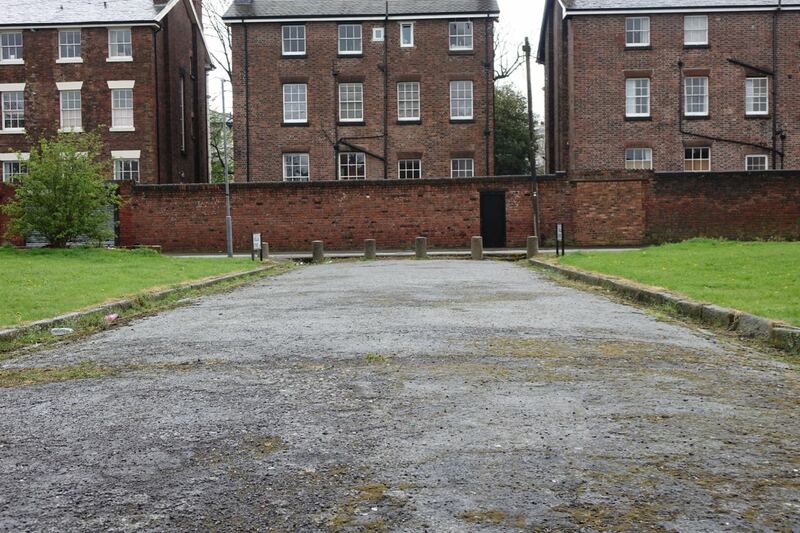 Now go well back in this post to the photograph of the wasted end of Mill Street now – and see how this idea worked out. 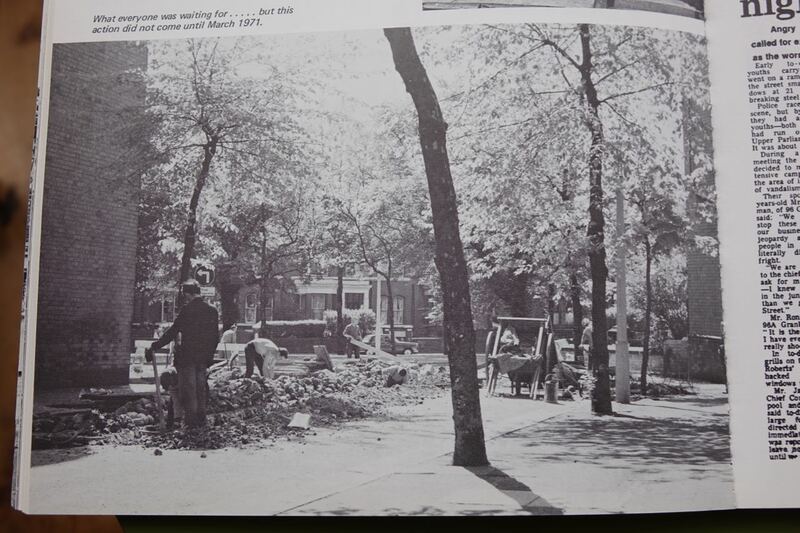 Istalling the bollards, on a sunny day in1971. 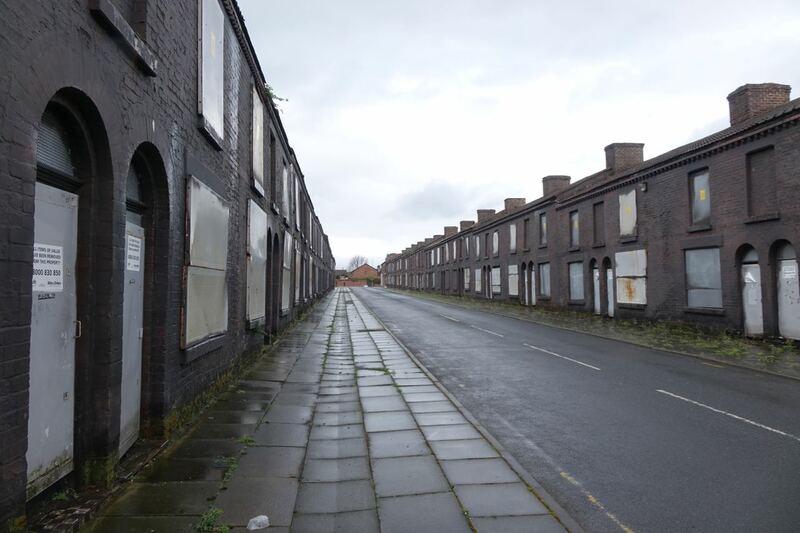 So, a fascinating if wet walk through urban planning history and how good intentions in one part of Liverpool 8 caused such arid consequences, as time went by, in other areas of the same district. It’s a load of bollards, of course. Aren’t some of the newer ones from when TWOC-ing became a thing? I think I remember hearing they were put in to block the long, straight roads so that joyriding would be less fun. What an excellent post! The innocuous bollard used as a tool to control the masses. 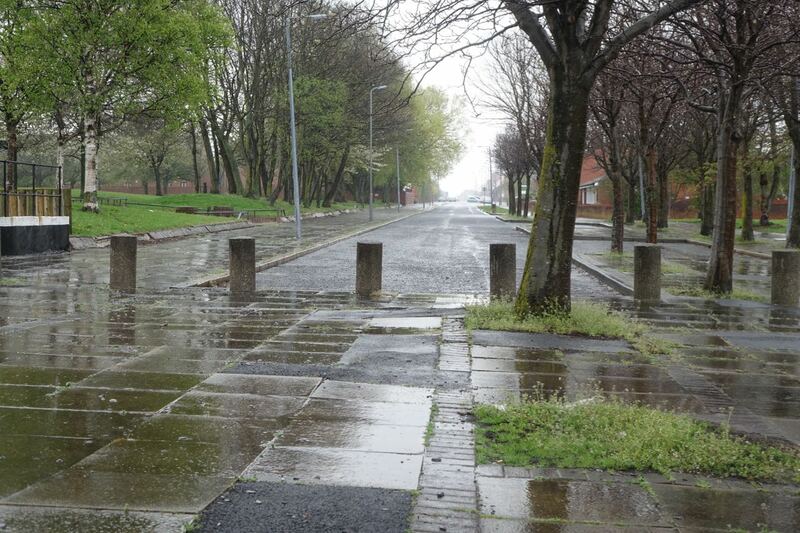 I worked on road end closures in Liverpool 8 in the late 1970’s( bollards and block ending certain road). 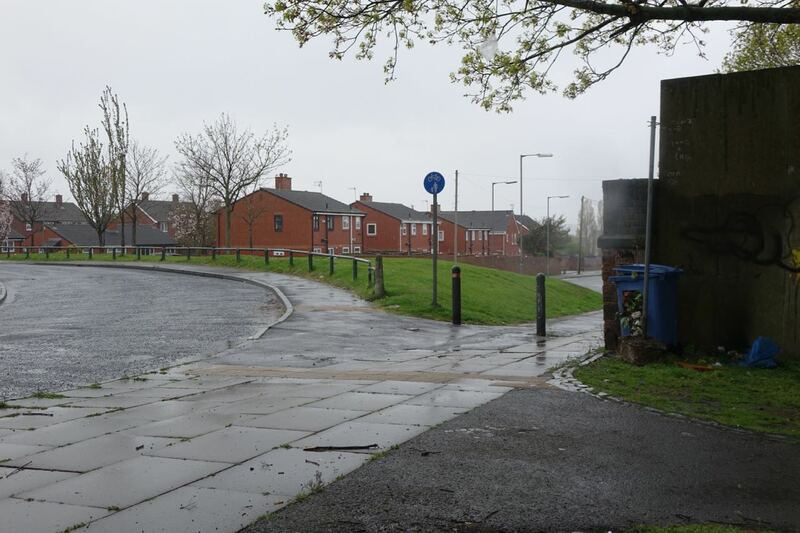 The work involved kerbing across the ends of specific roads and putting up heavy concrete bollard behind the newly kerbed off areas in Liverpool 8. 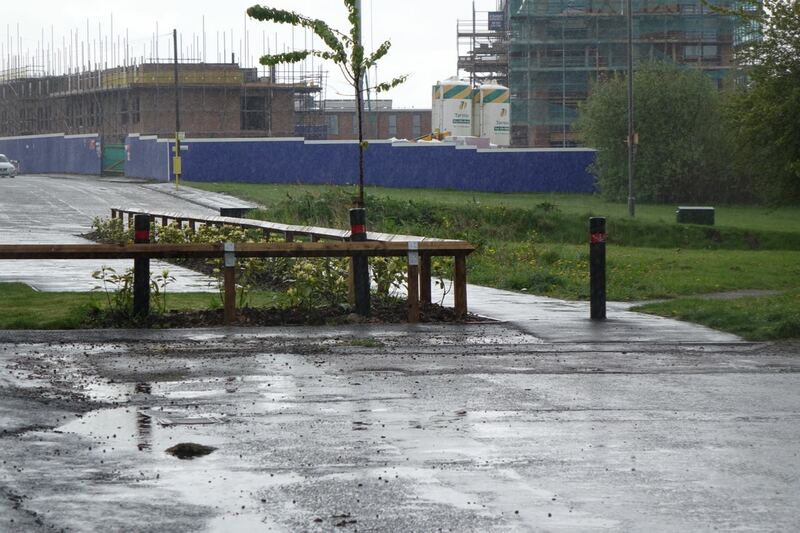 At the time I asked the City Planner responsible for the provision of this project why were we closing off road within Liverpool 8. 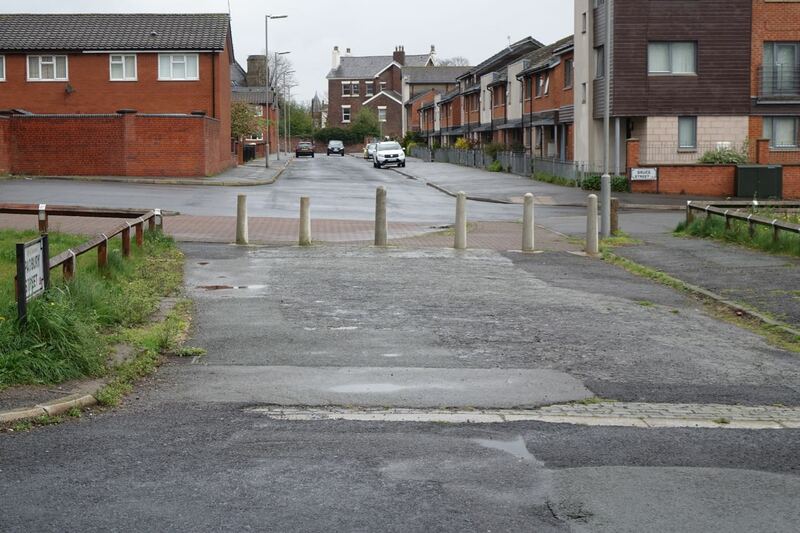 The road closure end programme was introduced by Liverpool City council as a direct request to stop joy riding in stolen cars and reduce robberies within the area by the police. 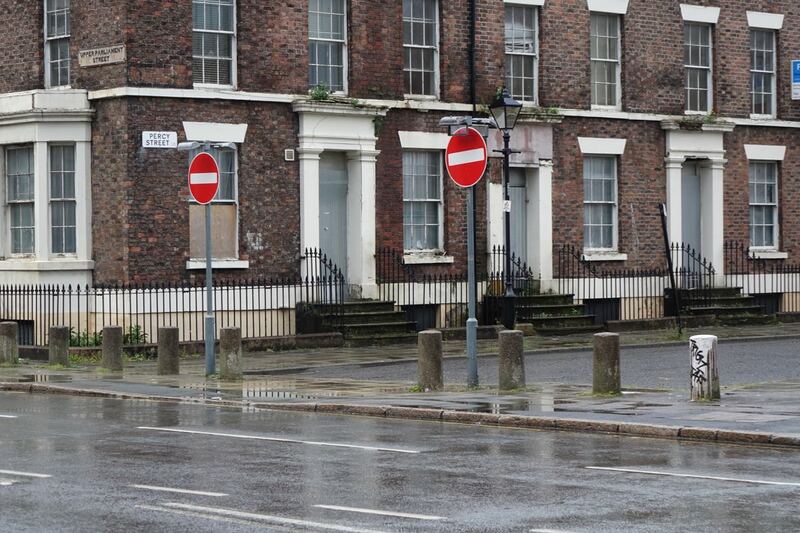 The police at the time were finding it difficult in stopping stolen cars in the maze of streets within Liverpool 8.Hence the road-end closure programme to curtail joy riding in this busy area of Liverpool. They(police had a limited amount of police officers/cars trying to stop joy riding in stolen cars. They also thought it would also assist in helping stop theft from bonded warehouses in the area, the stolen goods being taken away by vehicles stolen previously from other parts of the city. 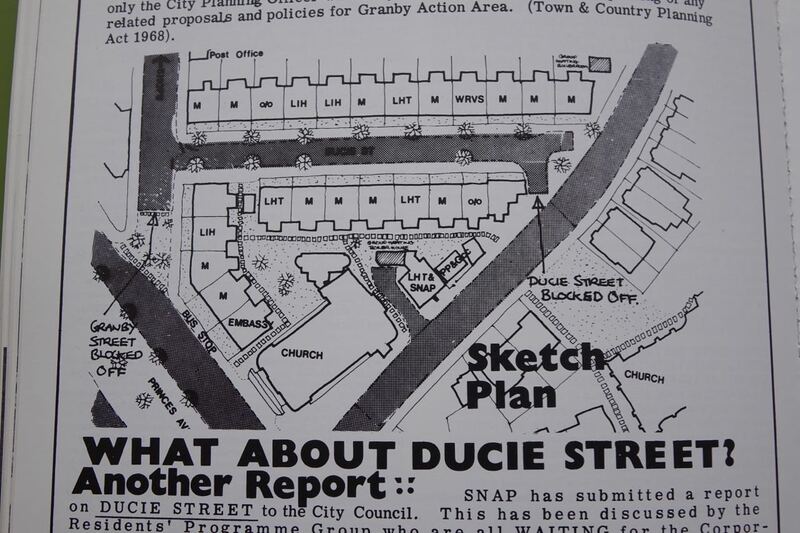 It was not to stop prostitution but organised crime in Liverpool 8. Hi Eric, the earlier bollarding in the 70s was done to stop kerb crawling. After that, well it’s debatable. I can well believe what you’ve said is what you were told at the time. But don’t forget that you were being told this about a police force who were then criticised by the Gifford Inquiry for being institutionally racist. So as I say, it’s debatable. 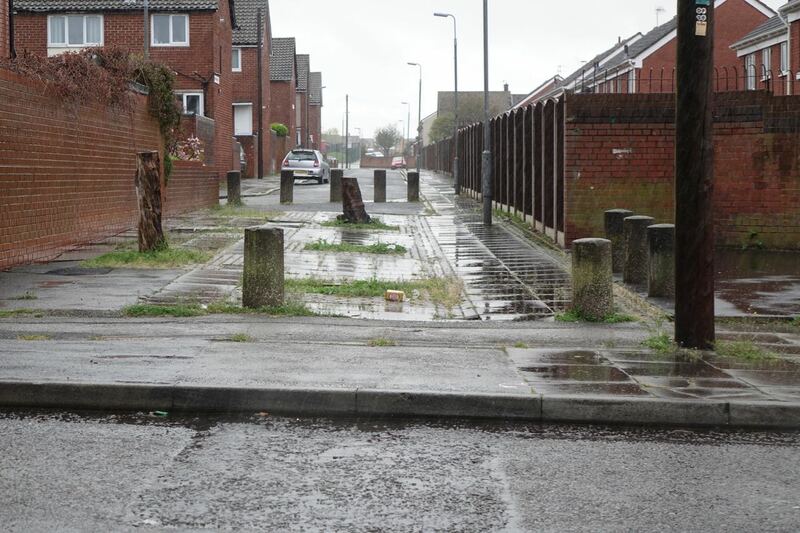 Hi Ron I worked for the highway department out of Garston Old road at the time and it’s not debatable as the then City Planner who I spoke to us at length over many weeks, stipulated the reasoning for this Block ending of certain roads within the Liverpool 8 area. 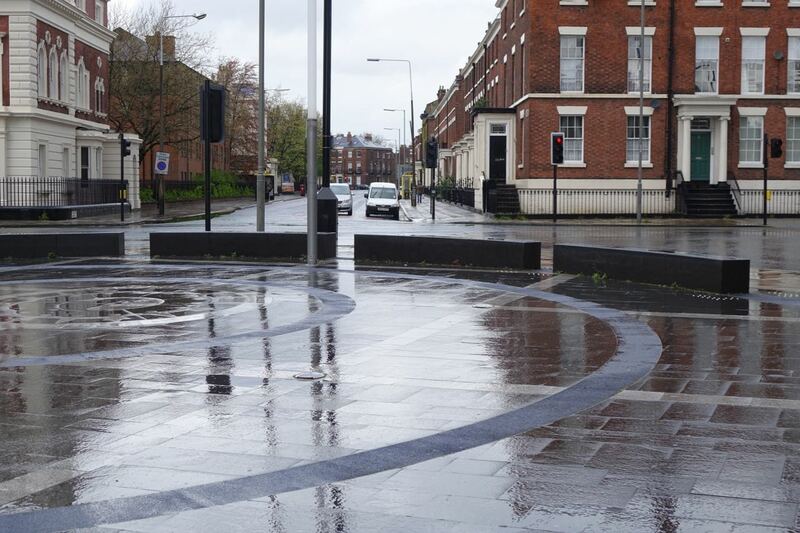 To stop kerb crawling was part of this project but was not the prime reason for it. 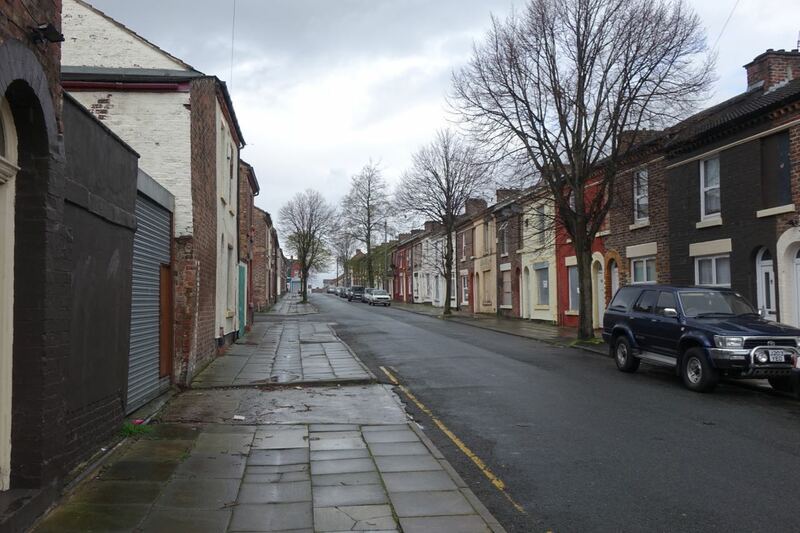 It was to try to prevent the Liverpool area from becoming a ‘No Go’ place were ordinary people could go about their business unhindered by the lack of police in the area. I lived and worked in the Liverpool 8 area for over 2 years at that time and can assure you it had little to do with controlling kerb crawling. 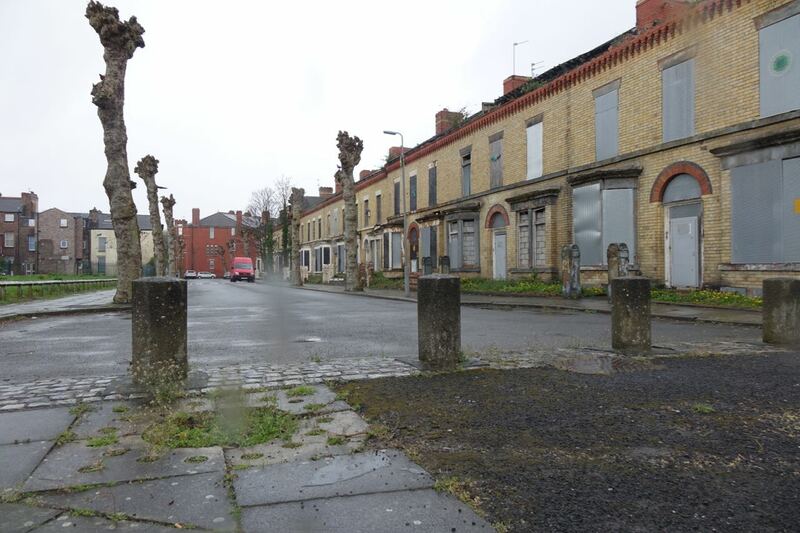 Although not from Liverpool 8, those law abiding people from this area at that time lived in an area which was tumbling in to ‘No Go’ area. The highway gangs which I worked with were also under stress and threats because of the type of work we were carrying out at tat time. Hi Eric, thanks for the details. 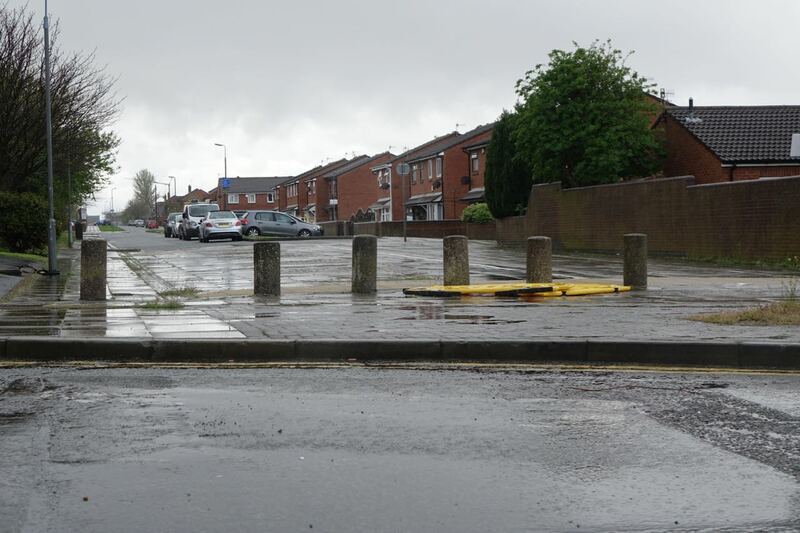 The early 70s bollards were, as I’ve said, put in at the request of Granby residents to stop kerb crawling. This is confirmed in the Shelter Report referred to in the posts. These were then extended to the Canning area later in the 70s for the same reason. I know that as I was working there at the time. Then it’s the 1980s bollards that are debatable. I’ve no doubt at all that you were told what you were told. 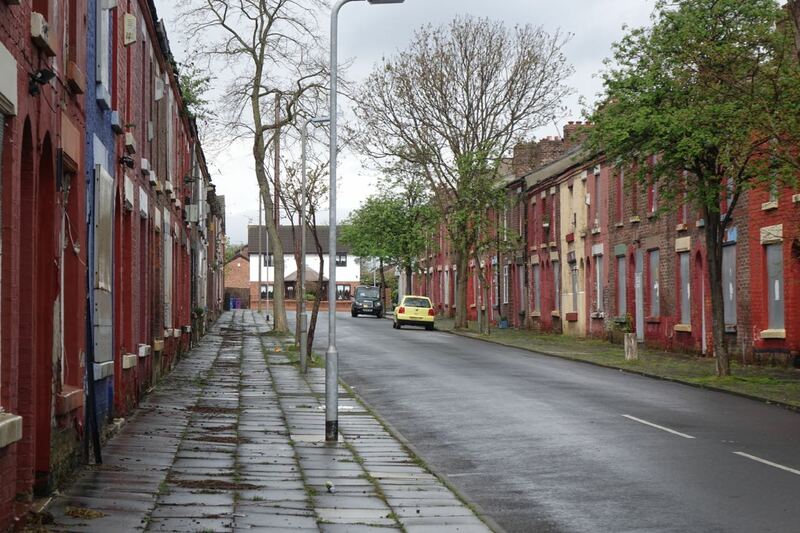 But things in Liverpool 8 were very difficult in that post riots time and I for one don’t trust anything the police or the city council said about their motives back then, institutionally racist as they turned out to be. The issue of block ending road and bollarding the ends of those road closures were not done on the issue of institutional racism by the police or the City Council at that time. 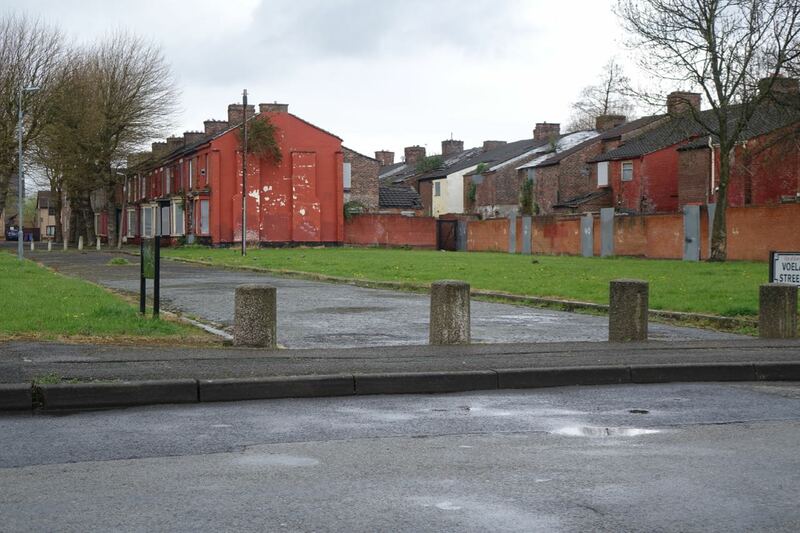 it was about ‘law and order’ losing ground to a lack of money and jobs in Liverpool 8 area. Many of my work mates were from the Liverpool 8 area and were white but some were black. It is not fair to stipulate that the sole reason for bollarding/block ending of roads was down to institutional racism. 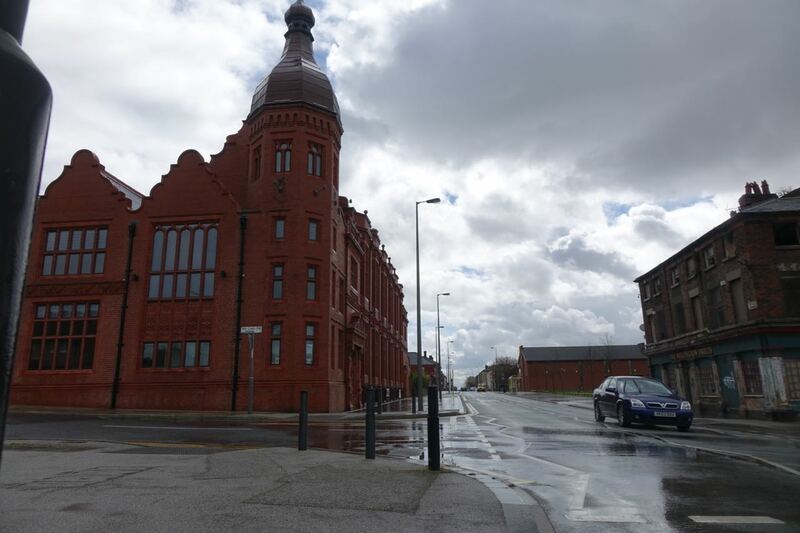 It was down to trying to protect the law abiding people of Liverpool 8 at that time from the mainly unemployed youth stealing cars -joyriding and theft from Bonded warehouses mainly around the old Carl Garden area. There were too many ‘rat runs’ for them to escape from being captured by the police, hence the road closure project. 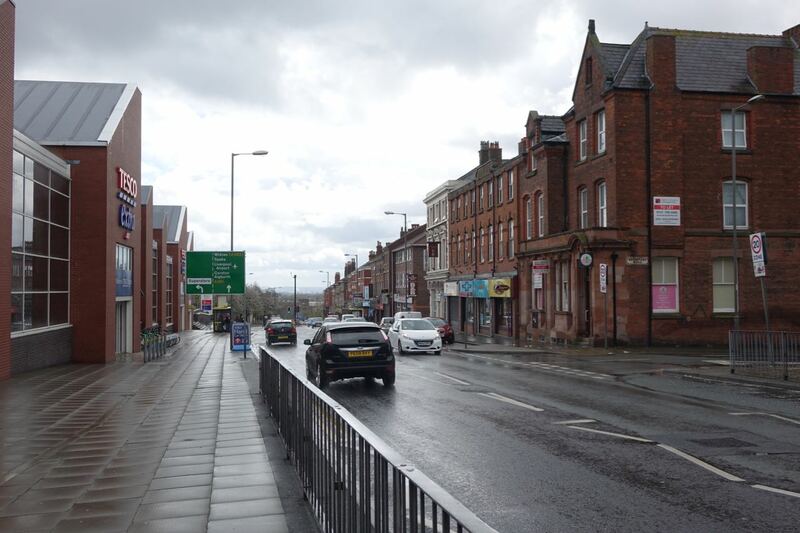 To get a road closed of in this manner requires it to be requested by council through legislation and quite a lengthy legal process to have bollards and road closure notices acted upon. 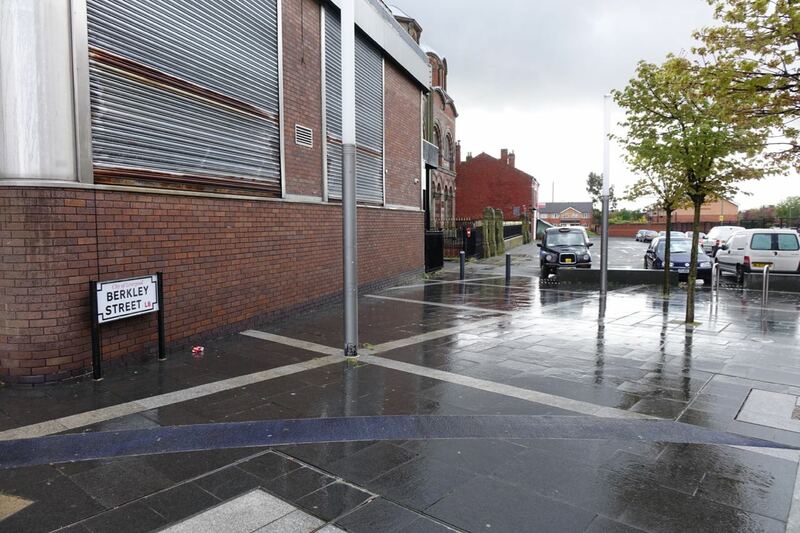 The road closure notices would have been discussed(and were discussed to my knowledge) with the different cultural/ethnic organisations within the Liverpool 8 area before the final decision was made to block-end certain roads within Liverpool 8. The project may or may not have worked to the satisfaction of the authorities at the time but it certainly stopped people being killed by joy-riders in stolen cars. 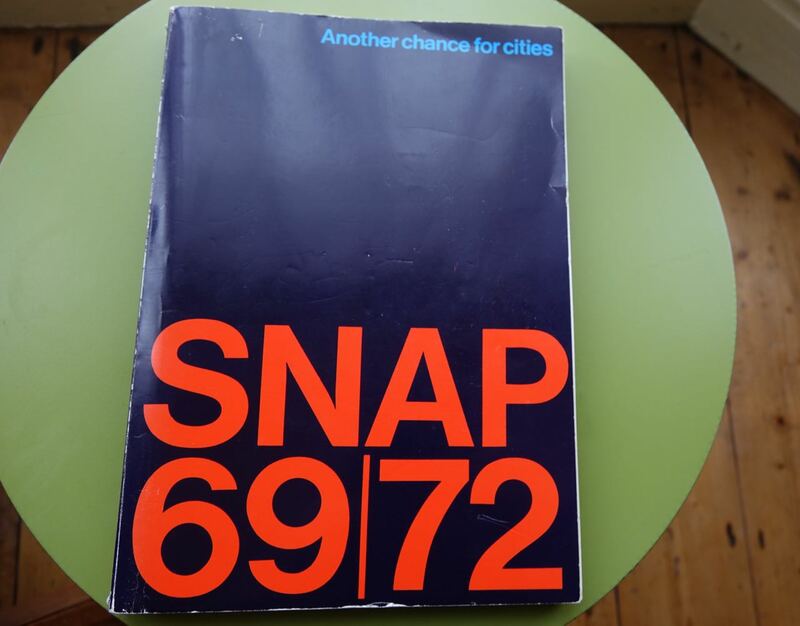 This was only one measure at the time but the riots that followed were a real indication that something more deeply embedded was not being addressed by the authorities and perhaps is still not being addressed today. Fair enough Eric, but I won’t be commenting any more on this.